Version 2.0 has been in development for almost a year now, and it's finally time. Version 2.0 has been tagged. A lot has changed, from new features to organisation changes. We'll go over the most important changes in this post. Besides all the features listed below, a lot of the codebase has ben rewritten and optimised across the board. On version 1, github.com/asgardcms contained all modules and platform. Platform itself didn't have any modules present as they were all fetched via composer. This worked well at the start but quickly made contributing to the CMS pretty tedious. In order to improve the general contribution workflow, this has greatly changed in version 2. Platform version 2 now has the modules committed. This makes contributing much easier and faster. Just clone the platform repository, and you're ready to go. Don't be alarmed, modules are still separated from the platform, they are now in a new GitHub organisation: https://github.com/Idavoll. These should never be touched manually, they're being kept up to date automatically. Previously pingpong/modules package was used to manage modules, it was however not maintained anymore, and asgardcms was using my forked version for a long time (it had a repositories key in composer.json). This was getting annoying to maintain. I've then decided to recreate the package under my namespace, nwidart/laravel-modules, applying changes that were broken in the original and most importantly added a full test suite to make sure it keeps working as expected. AsgardCMS has been upgraded to use laravel 5.4, previously version 1 was on the LTS version 5.1. All new shiny laravel features are thus available to you. It is now easier than ever to handle media on your custom modules. There are 2 new blade directives @mediaSingle and @mediaMultiple. It is no longer needed to have a bunch of additional steps of fetching the media in the controller. View the new documentation of linking media. In version 1, thumbnails were defined in a configuration file. This was causing issues with the config:cache command, which doesn't work when there are closures in the configuration. This could happen on some thumbnail types. To avoid this, thumbnails are now defined programmatically via an easy to use api. View the full documentation on this subject. Menu management now has more options to have more control over how a menu item should function. This is a new module, Tag. Everything (entities) can now easily be tagged thanks to this module. 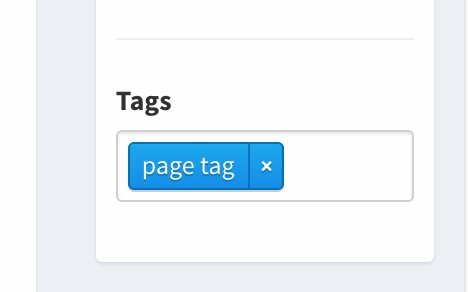 Tags have a namespace feature (asgardcms/recipe in example). This allows tags to only be visible in those namespaces. A tag created from module A, won't be visible in module B. Given both modules are using the tag feature. Two new documentation pages were added to explain this functionality. The Authentication contract has changed namespace and is now under the User module, which makes more sense. The check() method now doesn't return the user when someone is logged in, but will always return a boolean if logged in or not. To get the user, there's a new method user(). It is now possible to inherit permissions from the role! 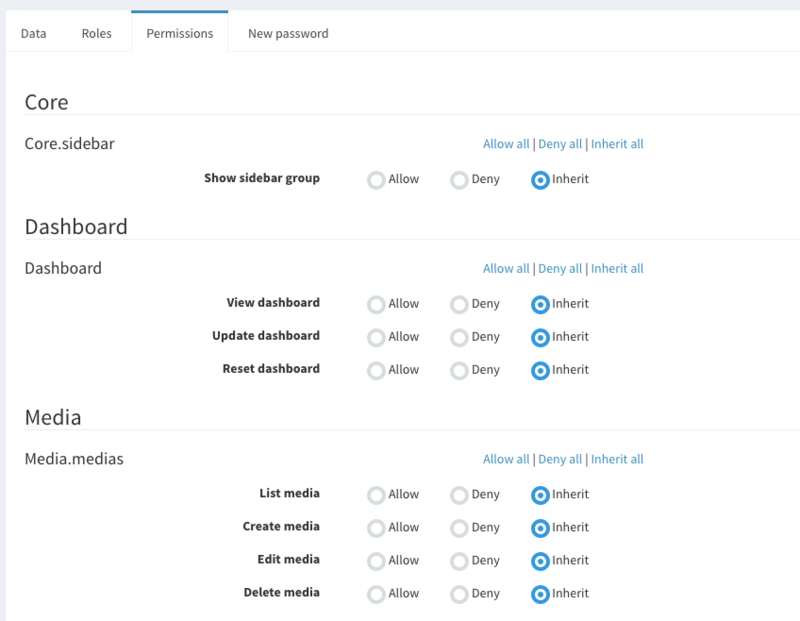 Previously, if a user had a role with specific permissions, and that user was updated via the backend, all its permissions were written on the user itself. Making changes on the role not affect the user permissions anymore. Thanks to the inherit feature this is no longer the case. In this example we want this specific route to only be accessible by users that have the user.users.index permission. It's now very easy to customise the (backend) sidebar for every single module. 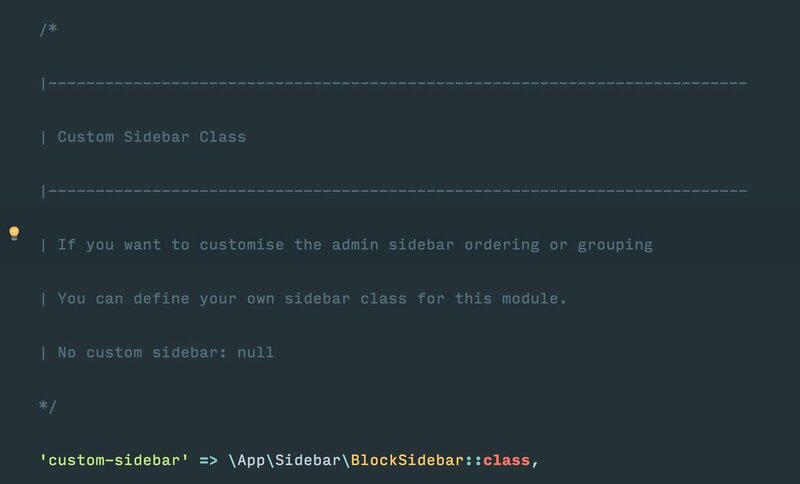 No more need to customise a core module, you can overwrite for each module, a custom sidebar class so you can change labels, ordering and so on. Complete changelogs can be viewed on the documentation page, available for each module and platform. Upgrade will be easy and quick, simply update the dependencies in your main composer.json file according to the one provided in the platform repository, and run composer update. After this you may need to fix issues following the laravel 5.4 upgrade guide. This will be more complex as version was using laravel version 5.1. The method I suggest is setting up a new 2.0 project, and moving your custom modules inside this project. You will then have to adapt those modules according tho the 2.0 changelogs and upgrade guides available on the documentation (listed before under changelogs title). In case you missed it you can support the AsgardCMS project with a plan starting at only 9,99 monthly! View all supporter plans here.